Avery Haskell says he first knew he wanted to be an astronaut ever since he was a boy growing up in Houston near NASA’s Johnson Space Center. The 24-year-old Stanford graduate who counts Stephen Hawking and Carl Sagan as his heroes grew up in an entrepreneurial family. In the early days of the internet his mother, an accountant in the oil and gas industry, and father, an information technology technician for a railroad, launched their own startup called “Neighbornet” — an early version of Zillow (which never got off the ground). Haskell himself bounced around the startup industry, with forays into launching a crowdfunding startup and stints at a few mobile technology companies, before landing on his current venture, Shuttle. 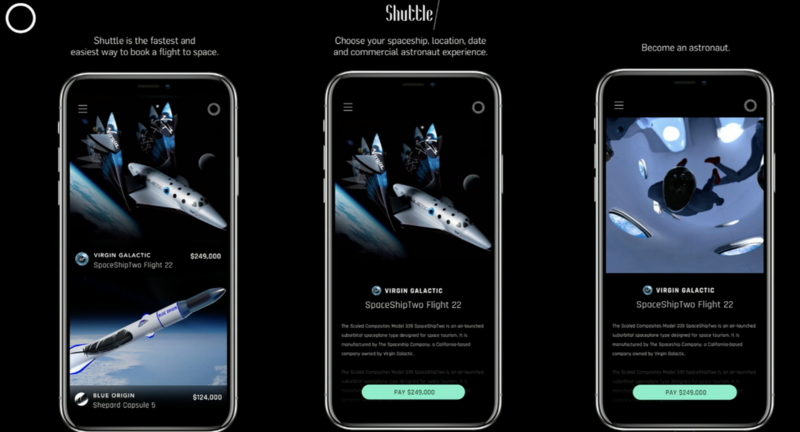 Launched earlier this year out of the Alchemist Accelerator and co-founded with cybersecurity expert and Wickr co-founder, Nico Sell, Shuttle is aiming to be the web and mobile-based booking agent for spaceflight. Haskell met Sell at the Alchemist Accelerator, where she first worked as a mentor to the young entrepreneur. But she quickly became enamored with the idea of working at the edge of a new kind of frontier market. The day that Sell agreed to be the chair of Shuttle was the day Elon Musk’s SpaceX landed two booster rockets back on earth nearly simultaneously. Purchasing tickets on a flight listed on Shuttle isn’t the same as buying a plane ticket on Kayak, primarily because the price points are higher to the point of near-absurdity if you’re not a member of the super rich. Offerings will range from trips on Virgin Galactic trips that will cost upwards of $250,000 in the near term to low-end packages that will include a zero-gravity flight aboard a tricked-out Boeing 747 for the low, low price of just under $5,000 per seat. The company is actually taking orders for its first zero gravity flight, which it expects to launch from San Francisco in March 2019. That’ll give roughly 34 people the opportunity to experience weightlessness for around 8 minutes. Shuttle is hoping to be the hub that aggregates all of these offers into a single one-stop shopping and media experience for consumers interested in seeking out existing planets and boldly going where only few men (and women) have gone before. And the company will offer virtual space tours and tickets to launches for the plebes who can’t afford an actual ride. Initially, expect the ultra-rich or the ultra-subsidized to be the only folks that will be able to take these trips. Sell sees a lot of opportunities in corporate packages for business customers — likening it to a trip to Kelly Slater’s Surf Ranch for an executive retreat. Sell believes that there will be upwards of 100,000 people in the next 10 years who’ll be willing to plunk down the $50,000 to $250,000 that it will cost to go to space. Already, the company has $1.66 million in bookings off of 8 customers on four Virgin Galactic flights and four Zero Gravity Charters with commission rates of 5 percent to 10 percent on flights that average $250,000 per ticket. As for what comes next, Haskell has some speculations. “We will probably be able to build a base on the moon very soon. By 2030 that’s a possibility. Within my lifetime it will be pretty common for people to travel to and from other planets in space,” he said. For him, the importance of Shuttle is getting Earth’s human residents to realize the fragility of our existence on the tiny blue ball we all share. Haskell said his favorite quote from Carl Sagan was “We are a way for the cosmos to know itself.” And if that’s true, Haskell believes that the experience of traveling through the cosmos may be a way for humans to come to a better understanding of themselves as well.